RALEIGH, NC, August 26, 2018 — BodyLase's commitment to education is one of the many things that separates them from other medical spas in the community. Each year, BodyLase invests thousands of dollars on continuing education for the team, building on what they already know, and challenging them to improve. This investment in their team helps make their medical spa and team the best in the Triangle. It also allows BodyLase clients to get amazing results because team members are up to date on the latest techniques and technologies available. 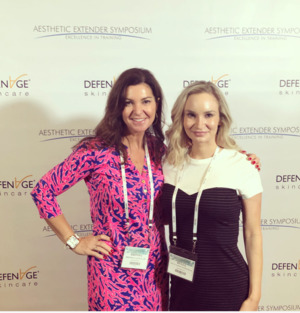 On August 23-26, 2018, two of BodyLase team members, Kelly Smith, medical aesthetician, and Rhonda Gately, Nurse Practitioner, attended the Aesthetic Extender Symposium in Boca Raton, FL. This conference will feature cutting edge educational sessions with live demonstration laser and injectable workshops. This four-day symposium features principles of safe and effective aesthetic treatments for facial rejuvenation. Participants receive CME Credit provided by AKH Inc., Advancing Knowledge in Healthcare. Also, this week two BodyLase team members, Victoria Larraz and Tiffany Clodfelter, attended Coolsculpting University in Virginia. CoolSculpting University is a comprehensive 3-day training program that offers providers with a one-of-a-kind training. Practitioners go over every aspect of the procedure, from start to finish, to develop skills and capabilities of delivering fantastic results to their clients. The CoolSculpting procedure targets and freezes fat cells with cryolipolysis, a unique advanced cooling technology. Fat cells in the treated area are then eliminated through the body's normal metabolic processes, in a way that does not harm the surrounding tissues. BodyLase has qualified as a Diamond Crystal Practice, which is the highest level in a multi-tiered customer rewards program recognizing the most successful practices within the elite network of Coolsculpting centers.